Download our Catalogs for Info and Pricing for Time Capsules, Plaques & Preservation Kits! We've placed all of our major items into our 10 page catalog. Here you will find pricing and sizes for all the different FPP Time Capsule Containers. See the standard sizes and pricing for our outdoor quality bronze and aluminum plaques. That section also has details for what you need to specify for your plaque, such as color of background, texture, mounting and border styles. Check out the different Preservation Kits - with contents listings - and the more popular archival supplies for long term storage. Print out all the info you need about our time capsule boxes and family time capsules. This catalog also details the time capsule options you might want - such as laser engraving for time capsules, easy packages for time capsules that include a plaque and kit, too. 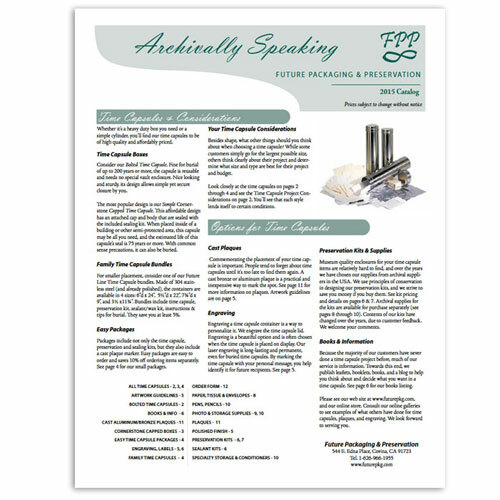 Our main catalog, Archivally Speaking. Currently, it contains 9 pages with an order form, or 10 pages in all. If you wish to have a logo or artwork on your plaque, please read and follow the information here before submitting to us. Here you can see the border styles, background color, rosettes and other information for plaques.